How often do you get the chance to sing with a world famous orchestra? 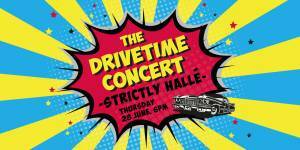 The Drivetime Choir allows you to do just that and to perform two classic choral pieces with hundreds of other people. This year the Drivetime Choir will perform Borodin’s thrilling choral spectacular, Polovtsian Dances. Last year we had nearly 700 choir members of all ages and experience, making a truly breath-taking sound. For those who took part, it was an unforgettable experience. Joining the choir is easy, open to all, and we won’t take up much of your time. Rehearsals are informal and fun and are led by our dynamic duo, Angela Kay MBE, Director of Music for Everyone, and accompanist Angela Foan. You just need to attend at least one of the main rehearsals on either Monday 25 June (7pm – 9pm) or Wednesday 27 June (7pm – 9pm). There’s a dress rehearsal with the orchestra on the day of the show, Thursday 28 June, at 5.15pm – it’s not compulsory but you’ll certainly find it helpful. Vocal scores for all Drivetime Choir members will be available free of charge from Friday 4 May 2018. To join the choir just fill in the online form HERE and book your concert ticket which you’ll get at the reduced choir member rate of £5.